When the topic for this week's posts came up, all of the contributors were enthusiastic about it. We're a geographically diverse bunch, as I'm sure you've noticed, and I suspect that you've found as many great books set in interesting locations as I have this week. My to-read pile, which is already extremely full, is about to topple under its own weight. But I have something to admit: I don't really like reading historical fiction set in the United States. Given the choice between a novel set in the U.S. and a novel set anywhere else, I'd probably pick the novel set outside the U.S. 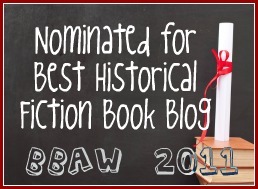 I've spent most of the time that I should have spent writing this post trying to figure out why I don't gravitate towards historical fiction set in the United States. I've narrowed it down to three basic elements: era, setting, and character. The Vanishing Point by Mary Sharratt. I read this years ago, and I remember being completely transfixed by it. The plot involves two English sisters, May and Hannah. May is sexually liberated for her time, and she flees her small English village for colonial Maryland in order to marry a distant cousin. Her sister, Hannah, travels to Maryland to join May, but when she arrives she finds that her sister is dead and that her husband has gone mad. Much of the novel involves Hannah's search for answers to her sister's mysterious disappearance, and it's quite dark at times, but I couldn't put it down. Into the Wilderness (and its sequels) by Sara Donati. Someone recommended this to me when I was reading Diana Gabaldon's Outlander series, and in library readers' advisory circles, it's often mentioned as an Outlander readalike. Donati's books don't involve time travel, but they have the same epic scope, beautifully-realized characters, and timeless romance. I wasn't sure I would like these as first, given that one of the main characters is from James Fenimore Cooper's Last of the Mohicans (also known as one of my most-hated books from college). But I loved them. Sometimes I have vivid memories of where I read a book, and for this series, it's the comfy blue couch in the apartment I lived in right after I got married. I can picture myself sitting there, snuggled among a bunch of pillows, tearing through this series at a ridiculous pace. The Heretic's Daughter and The Wolves of Andover by Kathleen Kent. Kent writes about outsiders: women who live on the fringes of society, generally by circumstance. The main character in The Heretic's Daughter is Sarah Carrier, daughter of Martha Carrier, the first woman to be executed in the Salem Witch Trials. Like her mother, Sarah is intelligent and rebellious--characteristics that won't get you very far in 17th century New England. Kent also provides an interesting perspective on the infamous Salem Witch Trials, showing how family turbulence combined with mass hysteria could have led to the execution of so many innocent women. The Wolves of Andover isn't a prequel per se, but it does contain another Carrier relation--in this case, Thomas Carrier--and features another headstrong, intelligent woman. Caleb's Crossing by Geraldine Brooks. I'm noticing a theme here: apparently, I prefer colonial or early American settings. This is another one: set in late 17th century New England. Bethia Mayfield is the daughter of a Calvinist minister, and like most colonial girls in contemporary historical fiction, she's headstrong and curious. When Bethia is twelve years old, she meets a young Native American man named Caleb, and their mutual interest in the wild local flora and fauna leads to a strong friendship. Bethia's father recognizes Caleb's intelligence and becomes his tutor, and Caleb becomes the first Native American to graduate from Harvard University. Caleb's struggle to cross cultures is fascinating, as is the view of the early years of the U.S.'s most storied academic institution. I actually found the topic a bit hard too, mainly because I too read a lot of historical fiction set in Europe. I third the recommendation for the Into the Wilderness series--love those books. Thanks for sharing! Thanks for the recommendation of the novels by Donati, I have added the author to my list of books and authors to look up! In contrast, I like the books set in early United States or Australia. I love the factual content of understanding the obstacles encountered by those early settlers. I'm the same way about preferring historical fiction from other places. For me it has to do with learning more about cultures that are very foreign to me, as well as the setting (such as royal courts/castles, etc.). I'm like you in that I rarely, if ever, read historical fiction set in the USA. Why is that? Truly puzzling. I think it may have to do with bad experiences reading American "classics" in school -- I hated virtually all of the US classics, with the notable exception of Poe's work and Hawthorne's work. I do like fiction about the Civil War period, though, and I am about to read a book about the Revolutionary War period for the HNS, so perhaps this will change in future. I enjoyed seeing your choices, anyway. my book blog: whiskersandtales1 (I haven't figured out how to access it from work yet, so I can't give you a link at the moment, but will be glad to do so later if you are interested).